There are numerous granulocytic forms seen here, including immature myeloid cells and bands. 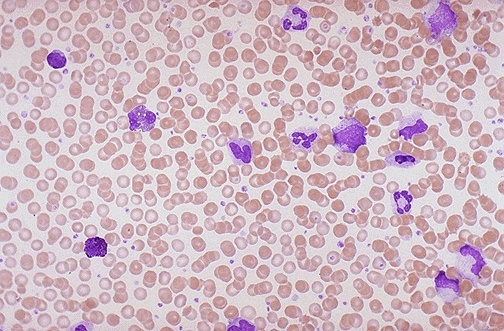 This condition is one of the myeloproliferative states and is known as chronic myelogenous leukemia (CML) that is most prevalent in middle-aged adults. A useful test to help distinguish this disease is the leukocyte alkaline phosphatase (LAP) score, which should be low with CML and high with a leukemoid reaction.